By definition, organic farming is a natural, traditional approach to agriculture without the use of any chemical agents, either fertilisers or pesticides, and no genetically modified fruits or vegetables, though to a certain extent hybrids are permitted within the broad context of "organic produce." Strictly speaking, most crops were "natural" or "organic" - Italians use the term biologico - until about a century ago, but already in the nineteenth century the Industrial Revolution had led to pollution of the environment and the early use of chemicals in agriculture. Here in Sicily the widespread use of agricultural chemicals really began only in the 1950s but caught on very rapidly. 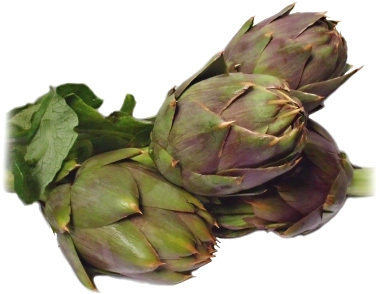 Certain Sicilian vegetables, such as the spiny artichokes (shown here) and wild asparagus sold in the street markets, may well be organic, having grown virtually untended in fields that haven't been treated with chemicals. However, to be sold under the European Union's organic certification precise requirements must be met based on rigid controls. The first EU regulations regarding organic farming were established in 1991 and today the agency responsible for this is its Standing Council on Organic Farming. A farm must be certified organic before it can display the EU "organic" logo on its products. In the case of packaged (or "processed") foods, at least 95% of the ingredients must be raised organically, and not treated with man-made chemicals during packaging, for the package to be so labelled. While most of us would probably agree that many organic foods taste better than those raised using other methods, not every Sicilian food product owes its unique flavour exclusively to organic agriculture. The award-winning olive oil of Titone, for example, is indeed organic yet its fresh, fruity flavour (which it retains even a year or two after bottling) results from a special, low-oxygen pressing method about which most other olive oil producers are quite ignorant. Planeta's La Segreta red wine (about half comes from the hearty Nero'd'Avola grape) is consistently good from vintage to vintage not only because of Sicily's consistently hot, sunny Summers but because of a special harvesting method - picking the grapes at night and placing them directly in cooled vats (out in the vineyards) for protection from the heat to restrict premature fermentation. Apart from natural approaches to fertilisation and defences against hungry insects (a few years ago part of Puglia was attacked by a huge swarm of locusts in the manner of a Biblical plague), organic farming is not particularly challenging. However, it is labour-intensive and yields are not always predictable. This can drive up the prices of organic products. There are some particular details. For example, for olives to be branded organic the trees and ground cannot have been treated with chemicals of any kind for at least three years. In Sicily, where at least 25% (and perhaps even 40%) of all olive trees have been virtually abandoned, with their fruit going unharvested, it's possible that quite a few olives, especially those grown on small private farms, are legitimately organic. In theory, however, the olive presses used to obtain oil from these "organic" olives would have to be used exclusively for organic fruit (and then certified) for the oil to be sold as "organic." Certain meats may also be certified organic based largely on the animals' feed and being "free range" in environments free of chemical treatment. In Sicily this might include some lamb, goat, rabbit and chicken but in practice these are rarely certified organic. Organic cheeses and ricotta would have to be made from the milk of livestock that grazed only in untreated pastures and consumed organic feed exclusively. Until about a decade ago, the organic movement was all but unknown in Sicily "officially." On a similar note, consider that only in the last few years have products such as gluten-free pasta, pizza and flour appeared here in stores and restaurants, particularly in Palermo and Catania. Those agriculturists at the vanguard of Sicily's organic "movement" are a hardy and enlightened few. The erudite Mary Taylor Simeti comes to mind (her organic farm, Bosco Falconeria, produces a wide range of products including wines). But enjoying Sicily's organic foods makes the search for them worth the effort.